» Why Not the Warriors? It doesn’t happen often, given the scarcity of true franchise players in the NBA, but once in a while, a legitimate championship contender lurks in the shadows. There are few real contenders every season, and most of those teams held that distinction over the previous seasons. The conference finalists that sneak up on us — the 2011 Mavericks, 2011 Thunder, 2009 Magic, 2006 Heat, 2004 Pistons1 — do so because, for whatever reason, we were not prepared to think of them as real contenders. Some are young teams on the upswing, ahead of their preconceived schedule. Some are older teams with strange new pieces and uninspiring postseason résumés. Most of them carry indicators that shout, “Hey! There’s a real contender here!” The 2011 Mavs had a killer record and point differential when their core players were healthy, but a solid percentage of experts picked Portland to upset them in the first round, and almost everyone was shocked they got by the imploding Lakers in the next.2 Teams earn reputations, and the perceptions that come with them, through their historical accomplishments, but that same history can blind us to a truth that doesn’t line up with it. Which brings me to a question that has been nagging me, and I suspect lots of other hard-core NBA types, over the last couple of weeks: Why not the Warriors? Why can’t Golden State make the Finals and even win the championship this season? Is there a legitimate answer that isn’t some version of, “Because they’re the Warriors, and the Warriors always lose”? There are serious barriers to Golden State’s title contention, of course — the first being that it has to stay healthy. You could say that about any team, but Golden State’s two cornerstone players have ugly injury histories, including recent ankle issues that verged on “chronic” status. The offense dies without Stephen Curry, and the defense dies without Andrew Bogut. Lose one at the wrong time and the Warriors are toast. And no team is anything like a “safe” bet to make it through the insane Western Conference. The roster just makes a lot of sense. Golden State reinvented itself with the Monta Ellis/Andrew Bogut swap, gambling that Bogut could get healthy and transform perhaps the most defensively incompetent franchise in league history. Mark Jackson’s coaching staff watched film of Bogut in Milwaukee and, with some input from Bogut, redesigned Golden State’s defensive philosophy to fit his skills. Golden State leaped to an unthinkable 13th in points allowed per possession last season, and in one of the most remarkable single-season transformations ever, it led the league in defensive rebounding rate after finishing dead last five straight seasons. The numbers don’t look championship-worthy at first glance. First off, Golden State has outscored opponents by 4.9 points per 100 possessions — a solid number, but only the eighth-best in the league, per NBA.com. Second, they’re fifth in the West, five games behind Portland and Oklahoma City in the loss column. But look a bit deeper, and you see the outlines of something. Golden State is 20-7 with Iguodala in the lineup, and in those 27 games, the Warriors have outscored opponents by about 7.5 points per 48 minutes — a mark that would rank behind only Indiana and San Antonio, per NBA.com. They’re fourth overall in points allowed per possession, and they’ve been better by that measure with Iguodala available than everyone but the ridiculous Pacers. Their starting lineup has outscored opponents by nearly 21 points per 100 possessions, by far the best margin of the 50 lineups in the league that have logged at least 150 minutes this season. 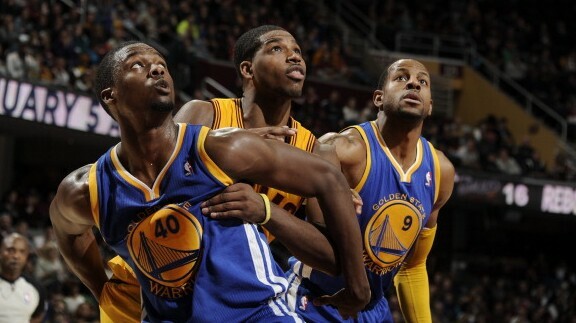 In simple terms: Golden State’s starting five may well be the best lineup in the entire NBA. So, again: Why not the Warriors? If you’re looking for weaknesses, you have to start on offense, where Golden State has been a disappointment relative to the hype. They’re just 13th in points per possession, and they actually improved a hair on that end with Iguodala out. They should be better, and some of the kinks that have dogged them should be at least semi-correctable. Only the Knicks finish a larger share of possessions via isolation plays, a go-it-alone tendency that is almost shameful for a team capable of lovely passing. Some isolations are fine. Lee can face up against bulkier power forwards, and the coaching staff has concluded that almost any Curry shot, even a step-back jumper out of a static one-on-one, is a good shot. 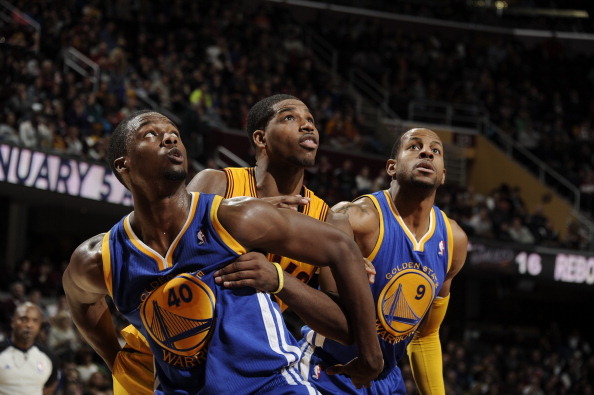 But the team needs to dial back the one-on-one stuff, especially with Thompson and Barnes. Thompson is just 18-of-54 (33 percent) on isolations, with a high turnover rate, per Synergy. Barnes has shot even worse — 16-of-54. Some of this is forgivable, especially for Barnes. Jackson too often asks Barnes to lead punchless units composed of five reserve players, and those lineups have been predictably terrible on offense. Good news: They shouldn’t see the light of day in the postseason, and it’s a very safe bet the Warriors will acquire a new backup point guard in the next month or so. The only question on that front is, how hard do they want to swing? They can get a scrap heap guy for basically nothing, but if they want a game-changer, they’ll have to think hard about including their 2019 first-round pick4 or one of Barnes and Thompson. This is pretty typical: A defense forces the pick-and-roll ball handler (Curry) to kick out to a spot-up shooter (Thompson), and it recovers to that shooter in time to discourage him from launching off the catch. The best offenses go from here into something else — another pick-and-roll, a dribble handoff, or an immediate pump-and-go drive from Thompson. But Golden State’s offense stalls out in a lot of these situations. Thompson and Barnes are ball stoppers, not yet confident enough in their dribbling or passing to attack right away or run a functional pick-and-roll. They like to hold the ball, size up their defender, and then begin a haze of crossovers, spins, and step-backs that lead nowhere. Thompson and Barnes aren’t quick enough to blow by prepared defenders, even bigger guys caught on switches, and so they often end up forcing difficult shots. It’s fair to wonder how much of this is systemic. Curry is the best ball handler on the team, but Golden State asks so much of him that he often looks exhausted, happy to stand off in the corner after that first pick-and-roll. And he’s such a great shooter that defenses almost have to try to take the ball out of his hands, via traps and extra help, once he reaches the 3-point arc. That leaves the dirty off-the-dribble work to someone else, and the collective “someone else” is a bit shaky with the ball. Golden State averages only 19 drives per game, per SportVU tracking data, the sixth-lowest mark in the league. This leads to a team that can struggle at times to get to the rim, earn free throws, and produce easy looks. There are other small issues — the team’s tendency to foul a lot, and the challenge any pack-the-paint defense faces in dealing with stretch power forwards who pop out for 3-pointers. There is some worry that postseason opponents, zeroed in on a single target, will focus more on attacking Lee in the pick-and-roll and posting up Curry regardless of where Golden State tries to hide him. But the Warriors’ defense is sound in general, and it has already experimented with useful counters for the Ryan Anderson/Dirk Nowitzki types. The more serious questions come on offense, but the raw material of a contender is here. Imagine that: a potential contender in Golden State. You don’t have to imagine anymore. Sanders is back to looking completely out of sorts with the ball. He’s 3-of-12 on post-ups so far, a tiny number, but they’ve mostly been bad midrange shots Sanders attempts after aimlessly dicking around with the ball for a few seconds. Between injuries, bar fights, and the disturbing reemergence of both Sanders’s temper and foul issues, this has been a lost season so far for him. This is worse than the worst-case scenario the Bucks could have imagined upon signing Sanders to a four-year, $44 million extension. The guy can still defend, but this has to turn around, fast. Thompson is so dangerous that the mere threat of Bogut screening for him will get Bogut’s defender (Chris Bosh here) concerned about sliding off Bogut to help on Thompson’s catch. And that half-second of hesitation is Bogut’s signal to ditch the screen and cut in for a lob that will often be wide-open — especially if the Warriors have some decoy action cooking on the weak side to distract defenders there. I’m not even sure whether this is a like or a dislike, but no player poses more of a danger to backboards than Martin. His jumpers land with such painful thuds, it almost hurts. Bradley is shooting 41 percent on corner 3s and 45 percent on midrange jumpers, the latter a very solid mark for a guy who shoots often from there; LaMarcus Aldridge, the leader in midrange attempts, is at 44 percent, and Bradley is right there with a bunch of other elite high-volume midrange guys. This does not make Bradley an elite shooter. He’s taking mostly open shots others create for him, though he can hit a pull-up on the pick-and-roll if a defender ducks under the screen, and his shot is not exactly a weapon. Teams don’t create game plans around Bradley’s midrange shooting, and he’s not a gravitational force whose shooting bends defenses toward him. He mostly takes what defenses give him, but he’s making those shots at a high rate. Not bad for a guy with alleged shooting problems who’s a year removed from double shoulder surgery. A Bradley who can hit open shots, work just a tad off the bounce, and hound opposing ball handlers is a valuable player. A few teams play tense music as the visiting opponent comes into the final few seconds of the shot clock. The Hawks, for instance, simply speed up the tempo of the “de-fense” organ beat to indicate the buzzer is near. But no one does it better than Sacramento. The Kings’ in-arena team plays what sounds like the screeching violin crescendo from Psycho, a set of notes that inspires appropriate terror in the face of a potential shot clock violation — a humiliation for the offense. But the notes are just a bit off-key, and a Kings rep tells me it’s actually a mash-up of the Psycho and Jaws themes. Great stuff. The play starts as a typical Rick Adelman set, with Love and Nikola Pekovic (rolling over everyone right now, by the way) anchoring things on the elbows as the other three players hover around them. Only instead of cutting to the corner or into the paint, Martin just rams himself right into Love’s defender as Love takes a backward dribble toward the 3-point arc. It’s some warped version of a pick-and-roll, and though it can create a messy jumble of bodies, it gets the end result the Wolves want. The Cavs’ boisterous broadcast team has grown on me. Carr is sometimes more booster than analyst, but he’s fun in that role, and I love when he just straight-up laughs at some opposing player’s mistake. It’s a scratchy, evil cackle, as if Carr himself masterminded the whole thing and saw it coming several steps in advance. Koufos is shooting just 50 percent within five feet of the rim, a dismal number for a big man, and he has had trouble scoring outside the George Karl spacing system that made his life very easy. Koufos has perked up of late on offense, but he has looked uncomfortable finishing against any sort of challenge, and with Marc Gasol near a return, his minutes might be in jeopardy. Ed Davis is playing very well as a key cog on the Grizzlies’ suddenly watchable bench, the organization likes Jon Leuer as a floor spacer, and the Gasol–Zach Randolph combo is going to eat a ton of minutes. Oladipo gets the ball below the 3-point arc, and on a dribble handoff, so that he doesn’t have to take a single dribble coming or going. Orlando has also cleared the weak side of the floor (the left side here) so that there is no defender behind Glen Davis to muck up Oladipo’s pocket pass. Baby steps. The Bobcats have scrambled after injuries to Michael Kidd-Gilchrist and Jeffery Taylor, using Anthony Tolliver at small forward and signing CDR back into our lives. And CDR, bless him, came prepared with a delightful floppy flattop sort of thing. I have no idea what the correct terminology is, but I’m in. There were varying degrees of sneaking going on in these examples, obviously. I wrote a midseason column calling those Mavs shadow contenders, but when it came down to brass tacks, I didn’t have the guts to pick them over the Lakers in the second round. And I had no reason for that, other than that the Lakers were the Lakers and the Mavs were the Mavs. I felt queasy making the pick. It might be the prediction I most regret in my NBA writing career. Synergy’s post-up stats include both shots by the post-up player himself and shots that come one, two, or even three passes down the line if a post player draws help and kicks the ball out. The Warriors traded their 2014 and 2017 first-rounders to Utah, so for the time being, they cannot trade any first-round pick before the 2019 selection. So is pizza! The Dubs allow it in their locker room. A few teams have generally banned high-carb foods. The hybrid lineups might decrease the team’s uncomfortable dependency on Curry. The team has scored 109.8 points per 100 possessions with Curry on the floor, and just 86.5 when he sits, per NBA.com. The first number would rank just behind Portland’s league-best scoring mark. The second number is 10 points below the Bucks’ league-worst offense.